144705-SS is rated 2.4 out of 5 by 18. Rated 2 out of 5 by Astoria from Love the look. After about 2 months the tub spout started to drip when the shower was not in use. Tried to see if I️ could adjust the “ limits” or tighten something at the diverter.I was unsuccessful not sure what my next step is. Rated 5 out of 5 by Jyssi from Love the unique design We have had the Delta Celice installed in our main bathroom (which is shared by 2 adults and 2 children) for almost a year and half. We have had no issues with anything and the finish looks as good as it did the day we installed it. And yes, we installed it ourselves. I really enjoy the design on the whole Celice series, it's very unique. I was concerned about cleaning on the ridges but they wipe off very easily and the finish appears to be "spot resistant". I would definitely buy this again to remodel our other bathroom, if we ever get there! Rated 5 out of 5 by JohnR from Love the new faucet! We love the new faucet! It looks and works great, and the shower head is excellent as well. Rated 1 out of 5 by LongTimeDeltaFan from Feel let down - terrible design leads to leaks. Let me start off by saying my family has always owned Delta growing up. It was a brand my dad said he would gladly pay more for because he could trust it to work for many years. And when something did finally wear out, they always stocked parts - even for discontinued models - it is what separated them from their competitors. Fast Forward to present day and unfortunately that just doesnt seem to be the case any more. My wife and I purchased this tub/shower combo at Lowes for a guest bath remodel and it does look great! The control also felt nice and smooth to use and it all appeared to be of the same high quality I was accustomed to. But only two years later, it began with an annoying dripping leak out of the spout and in a matter of two weeks turned into a steady stream ...not a drip - but a steady stream! As you know there is no shut off valve for only a bathroom tub, so that means we have to leave it on in order to use water throughout the rest of the house, or shut off the house water main (at the edge of the property next to the street) when we don't want to waste expensive city water. I worry about it all day when I'm not at home - afraid I'm going to come home to water gushing out everywhere. I went back to Lowes and was told I cannot get the 'cartridge part?' that was needed to fix the leak, that instead I would have to buy a whole new combo unit! This was not a cheap purchase folks, I certainly don't want to have buy one every two years! I called a plumber out who said his plumbing store also does not carry the part and that Delta products sold at big box hardware stores are very cheaply made and that he has seen this time and time again. After sharing with colleges at work, several of them told me the very same thing about Deltas cheaply made products in big box stores. I am extremely disappointed & let down that I purchased an expensive Delta product expecting the same quality that I grew up with only to find it has become the biggest headache in the house! I don't know what to do next. Changing brands or even switching to a different Delta model would probably require ripping out some of the new tile! Rated 3 out of 5 by smanella from Nice finish but leaking after 5 years. Installed 5 years ago and already need to change parts due to leaking at the spout. Rated 1 out of 5 by Patty123 from Very Disappointed Should have read the reviews of this shower/tub faucet before installing it in my remodeled quest bathroom. The shower only used when company is staying, so limited use and the faucet diverted already malfunctioned. The faucet never turned off all the way without several ups and downs on the lever, then this week the entire faucet seems to have fallen apart. The inside pieces are falling down out of the faucet so we are not able to use the shower at all. Would not recommend this faucet because the replacement piece costs $100 on this web site and the entire cost of the original through Lowes was approximately $169.00. It will be even more expensive to tear into the plumbing to change to a better made faucet. Hoping Delta will help with this design flaw. Rated 2 out of 5 by dts2805 from I don't recommend. Compared to the shower head and lever volume control handle the tub spout feels cheaply constructed and the shower diverter does not completely block water when taking a shower. The water pressure is reduced because of the leaky tub spout. This product is not worth the price tag. 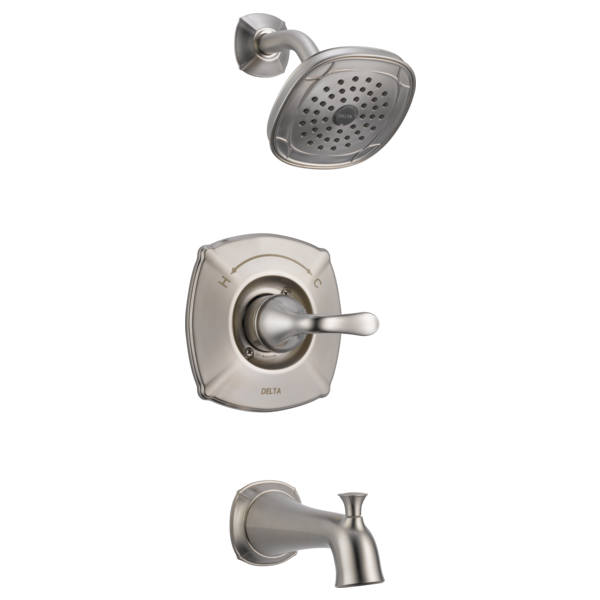 Rated 1 out of 5 by Sripriya from faucet to shower control not working We purchased this product when we bought our house and remodeled guest bathroom. It worked well for few months. But the rubber which stops the water from faucet and diverts to shower is not working. We can just use the faucet not the shower. I recently purchased this product (144705-SS) at a local Lowe's in Tucson AZ for a bathroom remodel. I need to know what country it was manufactured in for customs purposes as I am shipping it to the US Virgin Islands. Thank you for your question. 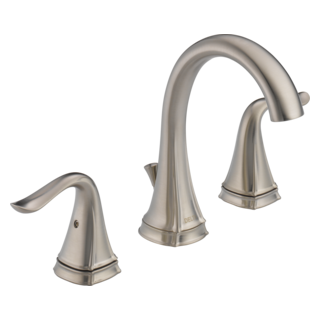 Delta Faucet model #144705-SS is manufactured in USA. Does the Shower/Tub combo come with overflow cover and drain ring/plug ? Can a hand held shower be used with this model. Thank you for your question. 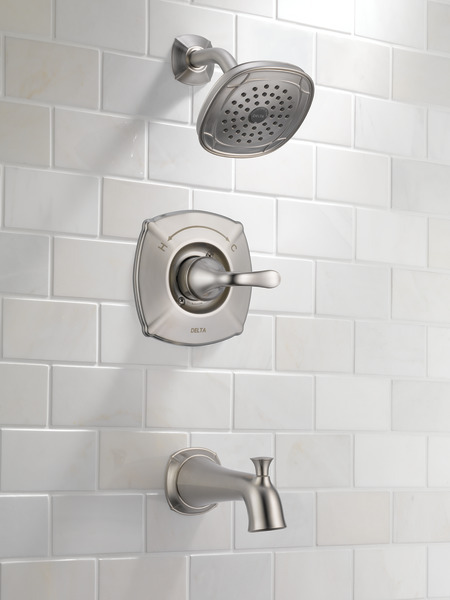 Delta Faucet model # 144705-SS can have a hand held shower added to it. There are two ways to add it. One way to purchase a shower arm diverter that attaches right behind the showerhead. One model we have is 50650-SS. Another way is to install a rough-in diverter valve, R11000 with a diverter trim. We have a few diverter trims to choose from like the T11800-SS. You will also need the wall supply elbow which is 50650-SS to complete this faucet set-up. We are doing a remodelling project. We have a spout and a shower head already, we just want to buy the mixer valve with a cartridge. Can we do that, or do we have to buy the complete ensemble? I replaced the cartridge and lost my rotational limit stop pieces. Cannot find a part number for a replacement. What is this part number so I can get one ordered? How to install the pull-up diverter? The pull-up diverter on my tub faucet got jammed. I was able to take it apart, but can't figure out how to get it put it back together. Do you have installation instructions? Or am I going to have to purchase a whole new faucet? My shower head appears to be putting out more water than my drain can handle. I have cleaned the drains and ensured they are clear and working properly. Is there a way to get a new or replacement water reducer for the shower head?